When I lived in New York, my husband and I were fortunate to go to a Broadway show whenever we wanted. Since moving, we do not have that luxury so I have to plan ahead which shows to see. 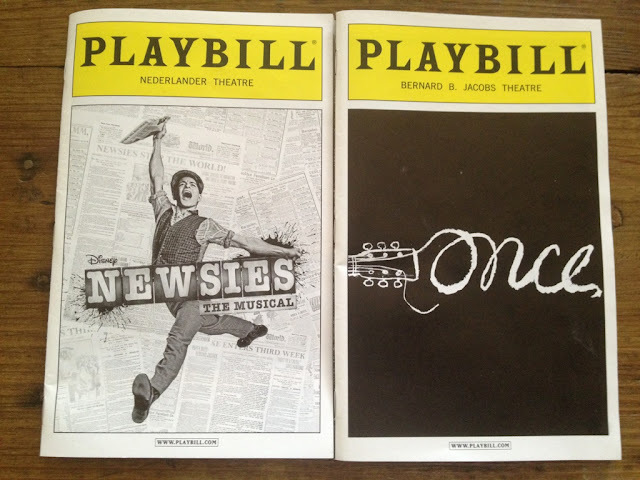 This year I researched all of the new shows to see what the latest broadway buzz was about. Once the Tony Awards air in June, it is nearly impossible to get tickets to the shows that win Best Musical, Best Play, etc. This year, I think Newsies and Once will lead the pack with the most nominations! We also saw Jesus Christ Superstar which I was less than impressed with so don't waste your time if you only have a few days in New York. We did not get a chance to see Peter and the Star Catcher but I heard it was fabulous so that is another show to check out this year! Newsies is a musical about a group of poor news boys who strike against the rich newspaper giants at the turn of the century. This musical is high energy, very entertaining and appropriate for all ages! Once originated as an Irish film in 2006 and is about a young musician who falls in love with a Czech immigrant and the plot showcases their love of music together. This show is geared for a more mature audience and is more artsy than your normal musical. Last year my husband and I saw the highly acclaimed musical, Book of Mormon. We went before the Tony Awards aired so we did not have trouble getting a ticket but it is still one of the hardest tickets to come by. Wicked is also very popular and plays to a sold out show almost every night. These are still some of my favorite shows so make sure you buy your tickets ahead of time if you want to see either of these shows.